Supervisors who oversee construction sites are expected to make sure that employees are safe and that all workers on a site take appropriate safety precautions. If they fail to require basic safety precautions, they could be held liable for worker injuries. If you have been injured or lost a loved one in a construction accident and suspect that the actions of management played a part in creating dangerous conditions, contact the attorneys of The Orlow Firm. We have handled numerous construction site accident and injury cases and are skilled at holding management accountable, as well as third parties like owners, contractors and subcontractors. Were you injured due to an unsafe construction site? Do you believe that a manager or supervisor contributed to the problem instead of solving it? Call The Orlow Firm at (646) 647-3398 or contact us online for a free consultation. 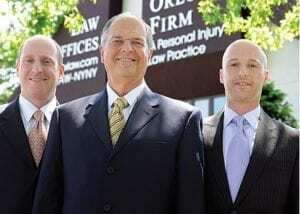 The Orlow Firm has been helping clients in personal injury and construction accident cases for more than 30 years. We truly care for each of our clients, and we are focused on getting the results all our clients deserve. We have recovered many millions of dollars for injured construction workers. Undocumented workers in New York City who are injured due to supervisor negligence have rights to compensation. Se habla español. For more information regarding your rights following a construction site accident due to supervisor negligence, contact an experienced NYC supervisor negligence lawyer at The Orlow Firm. We offer free initial consultations and operate four offices across New York City for your convenience. We can go to you if you cannot come to us. To contact a lawyer, call (646) 647-3398 or contact us online. Se habla español.